I remember the time was around 2005 or 6. A group of us was having an informal coffee shop gathering. Back then, I just got out of university, while most of my friends was in their final year or repeating one more year. One of them, lets call him John, learn about investing in stocks and was discussing it. I was still swimming mainly in unit trust and only tip-toed my way into stocks. You can learn a lot of things when you interact with people in university so learning about buying good paying dividend stocks sound like a competency that will stay with you for the rest of your life. 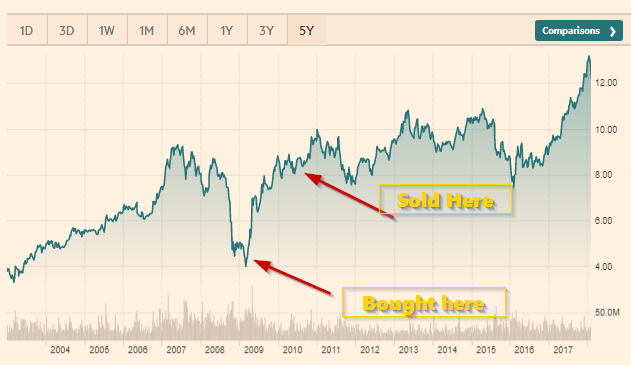 So come 2007 and 2008, as I was freaking out, He managed to buy one of the banking stock for $4. We know that this banking stock went to the high north of $12 recently, however I do understand he sold out at $8.00. His competency tells him that the way the market works s that it is cyclical, there will always be a bear soon. You buy deep in the bear and then sell with profits and wait for the bear market. What happened was that he kept waiting upon the next similar 50% market draw down. That didn’t come for the next 7 years. On average a bull market is 4.5 years long and bear a short 2 years. This happens to be one of the abnormal one. And it turns out if your strategy is to wait for an absolute 50% draw down, you wouldn’t purchase at all those 18% dips in 2015, 7-12% dips in 2011 or 2014. Stocks or equity tend to have a positive bias. That means that overtime they tend to be higher. If you choose to keep cash, there is an opportunity cost. The opportunity cost is the return that you can earn in the stock market. Let’s use an average return of 7%/yr if you are invested in stocks. If you are 50% in cash, your overall expected return is 3.5%/yr. The table above shows your allocation to stocks and cash, and how much in these 7 years you would accumulate. The difference between 0% stocks and 100% stocks is almost $20,000 or 24% more. A 24% increase do not look much if your funding to wealth building is still a large percentage of your overall portfolio. However, if you are at the end stage, missing out on 24% can be significant. 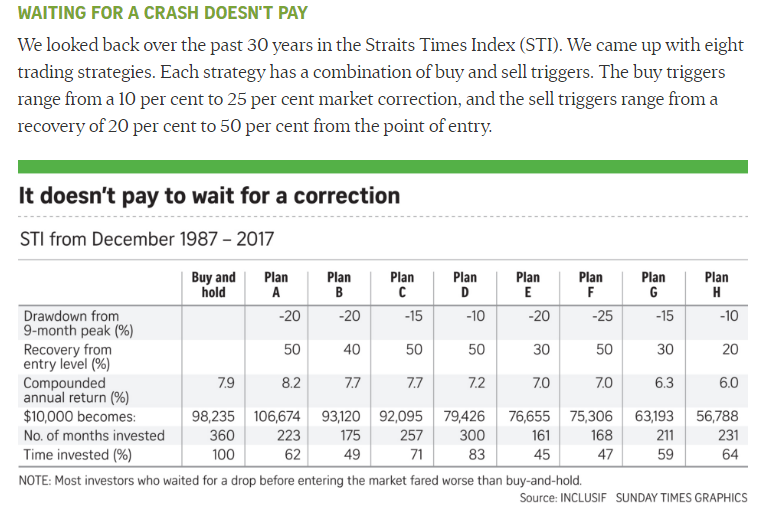 In the Straits Times on 11th of Feb 2018, Teh Hooi Ling, the portfolio manager of Inclusif Value Fund, illustrate the opportunity cost of waiting for a large draw down. She brings us through various draw downs, and various marketing timing realization after successful picking the bottom. Only one out of all the plans beat the buy and hold approach (Plan A). Ben Carlson over at a Wealth Of Common Sense wrote an article about Upside Risk Management. The most commonly cited example why you should think about the down side is the amount of return you require to break even, if your wealth falls. If your wealth falls by -20%, you need a 25% gain to break even back to your original level of wealth. 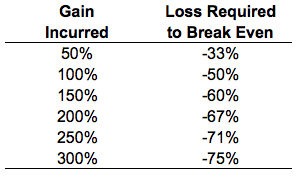 IF your wealth falls by -50%, you require 100% gain to break even. And 100% gain can be challenging. The cost of staying in cash is instead of averting a massive drawn down, you missed a massive upside. In the table above, Ben Carlson tilted things. You may missed out on a 100% gain. The market could then correct -20%, -30% or -50%. If it corrects -20%, to -49%, you might still gain more than if you are not in the market. If the market corrects -50%, you end up breaking even. If we looked at the bull market in the USA, it went up by 200-250%. 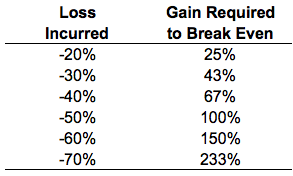 Those who have that gain, would need the markets to go down -67% to -71% to break even. And those are real outlier events. Even a -30% and -50% events are not an annual affair. Putting it this way, and that there are more incidence of positive markets then negative ones in the past, missing out on the upside by waiting can be rather costly. Put in simpler terms, it means that while we may reasonably expect a correction to happen some time in the future, we don’t know when for sure. When the correction doesn’t happen for some time, some investors may get pushed to invest at higher prices. And when the correction finally happens, it may be from a significantly higher level from today. The after-correction level could still be higher than the level today, in which case, investors would have missed out on that return. If the big draw down happens immediately, the wait for the big draw down strategy shines. If the market have some legs to run, then that strategy has more opportunity cost. A $1000 market becomes $500. You get to invest in a $500 market and earn 100% return when it runs to $1000. If the $1000 market becomes $2000, and there is a draw down of 50% (similar to the previous situation), the person that is invested ends up back at square one ($1000). He didn’t lose any money. He might as well have invested this whole time. The above scenario is more incredulous if we believe how hard it is for us to guess when the draw down will occur, when the market will go on a bull run. How Stringent and How Loose is your Definition of a Crash and Recovery? We do not know when these events happen. To some risk adverse people, even the 4% one day fall is a “crash”. So what if you buy after a 4% “crash” and then the market goes down another 10%? (because technically 10% corrections in 3 years is very common!) How would your strategy handle that? If you define the crash threshold too stringently (say, a drop of 25 per cent), you stay out of the markets for the most part, which is bad because long-run equity returns are positive. This is what happened in Plan F. The correction in 2015/2016 did not hit 25 per cent, so the buy threshold was not reached. As a result, that portfolio has stayed in cash since May 2013. Consequently, it missed out on a total return of 12.5 per cent from then until the end of last year. If you define the recovery threshold too loosely (say, up 20 per cent), you exit the equities market too quickly, which is bad because long-run equity returns are positive. 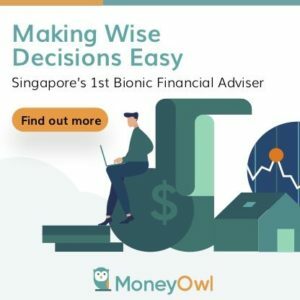 If you define the recovery threshold too stringently (say, up 50 per cent), you pretty much get returns that are quite similar to a buy-and-hold strategy, since you will stay invested for a long time once you enter. What Strategy Should you Adopt? If we are purely talking about wealth accumulation, it is imperative you avoid massive draw downs. Most people’s psychology cannot take it if their net worth goes into a tailspin. However, staying in cash 100% has costly upside risk as well. The solution lie closer to the middle. You can tilt your allocation based on these information to lean closer to more cash or more stocks. Having 100% in cash is often a bad plan because not many people have such a good crystal ball to predict when a 50% draw down will happen. Having an allocation means you can at least participate in the upside while not over-exposing you if you are anxious about the downside. This is the high level strategy. If you are an active stock investor, you will have to work within this 50%, 65% or 80% stock allocation window. If you need to spend down your asset, you have to position your portfolio differently. The above evaluation is mainly for wealth accumulation phase. If you are financially independent, and are starting to spend part of your wealth cash flow from your portfolio, it is better to avoid a massive draw down. When you are draw down money, and your portfolio of $700,000 falls to $500,000, the draw down depletes the portfolio even more such that you have less on your portfolio to come back, this is the sequence of return risk. Avoiding a market draw down at the start of spending down is important if a fixed sum of $700,000 is absolutely necessary. If you need $700,000, but you have grown it to $1,000,000, then you can tolerate some draw down. This is similar to you putting 50%-100% of your $700,000 into stocks and watching it grow to $1,000,000. Even if there is a draw down, it affects the sustainability of your wealth over time because you actually need much less. I wrote a fair bit of wealth de-accumulation strategies in my retirement planning section. I shall not go deep into this. The important take a away is to know whether you are in accumulation mode or the mode where you need to withdraw your wealth. Missing out on some opportunity cost of staying in cash might be a better idea. I must say that I have always been guarding the downside and now I realize, I seldom guard the upside risk. My friend and my example are not unique. I have acquaintance that share with me his friend also am waiting since 2010. If you missed out on the upside risks, you get screwed pretty badly as well. I realize, those that were more successful were able to detach themselves from their portfolio because they treated it more like a game. They function much better in their active stock investing decisions. I find that very hard to think that way because my wealth provides some function for my life. I guess the solution to this is to grow it to such an extend that, relative to your annual expenses, your wealth is so much that you have more margin of safety. Then you can treat it as a game and function better. I keep most of my thoughts on active stock investing in my Active Investing Section. If you are interested in doing active wealth building, you might wish to take a look. Between the 2, more important to protect the downside. To guard against upside risk, simply exercise common sense & use your usual TA or FA to get into “good assets” (whatever your FATA tells you). Instead of having a hard target like -50% or -40% that requires a 3-sigma event, or waiting 10 years. E.g. S&P500 didn’t experience a -50% drawdown from 1982 until maybe 2002 (not even -50% then). To rely on portfolio for retirement with equanimity, need initial cash/safe govt bond allocation sufficient for at least 4-5 years of living expenses. During retirement, protecting against more than -15% drawdowns is paramount. For those not able to closely monitor & execute strategies for downside protection, then 1 suggestion is simply not to have more than 40% of portfolio in equities or risk assets. And just do annual rebalancing. Hi Sinkie, thanks for the reply. If you use TA or FA to get into assets, you are using something other than a simple case of wait and buy the high magnitude crash. That is ok. I disagree that we need an initial cash or safe bond allocation for retirement after my recent research, there is an opportunity cost to holding 5 years worth of expenses as cash.